In an effort to replace Alex Rodriguez at third base New York Yankees GM Brian Cashman met with Florida Marlins yesterday to discuss Miguel Cabrera’s chances of coming to the Bronx. Speculation into this particular rumor has sparked much debate among fans. 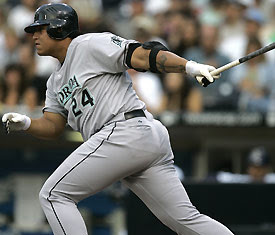 Many see him as the next Arod, pointing to the fact that at just 24 years of age he has compiled amazing stats like 138 homeruns and a career .929 OPS. Cabrera would certainly fit into the middle of the Yankees lineup well and at the same time provide the much needed right handed power threat they are going to need. At the same time fans critical of the deal are certainly right in their concerns pointing to his lack of defense and the self discipline to keep himself in shape as causes for concern. What good is Cabrera going to be for the Yankees if he enjoys the New York nightlife more the pressure and expectations of winning? On Tuesday Cabrera’s former manager Joe Girardi chimed in on the debate. “I didn't have any problems with him. He worked hard for me,” Girardi told the NY Times. Girardi also told the NY Daily News, “I had him and I know what he did for me. He's a great player and a smart player. He really understands the game of baseball. I loved having him." With the Yankee’s manager supporting a move to get Cabrera the large question looming is whether or not it would be worth going after the 24-year old third baseman since it appears the Yankees are going to have to pay a lot to get him. Florida Marlin’s president Larry Beinfest is certainly not going to offer Cabrera as a mere salary dump. "When you trade really good players, you want really good players in return,” said Beinfest to the Daily News. This means he is going to be looking at getting a Phil Hughes, Joba Chamberlain, or Ian Kennedy in return. Players Cashman has been reluctant to move in the past. The last time the Marlins traded players of this caliber they got back one of the best offensive shortstops in baseball, Hanley Ramirez, and a pitcher who threw a no-hitter in his rookie season, Annibel Sanchez, among others. It is rumored that Florida has already told the Yankees there is no deal unless Hughes or Joba are involved. “I'm sure I'll be challenged like I have been in the past on those guys," Cashman told the Daily News. "No one is untouchable, but some guys are less touchable than others, and those guys fall into that category. I will be tested a lot and this organization will be tested a lot on that." While there is cause for concern when acquiring a player with the lackadaisical mentality of a player like Manny Ramirez, the Red Sox were able to ride his bat to two World Series victories, but can Yankees fans accept Miguel being Miguel? I think they could as long as next year’s starting rotation isn’t tampered with. If the Yankees are able to pass on players like Humberto Sanchez, Alan Horne, and Wilson Betemit then they should not hesitate to make a move, but what good is acquiring a new third baseman if the team is going to have a hole in centerfield or be kicking themselves every time Kennedy wins 15 games for the Marlins? The Yankees should continue to kick the tires on this deal while they search for other options and wait for Marlins asking price to go down. If only they can figure out a way to include Dontrelle Willis in on this deal. Until then they will continue to sift through names like Aaron Boone, Garrett Akins, and Joe Crede. For more Yankees and Mets off-season rumors go to Hot Stove New York.